In September’s Westside Observer issue, Dr. Palmer and I addressed whether the proposed closure of sub-acute and skilled nursing units would result in eviction and exile for the 28 current patients at St. Luke’s. Before then, CPMC had been adamant by asserting that the two units would be closed because there was “no room” in either the replacement hospital for St. Luke’s or CPMCs new “destination” hospital on Van Ness Avenue to accommodate them in either of the two new facilities. Those 28 patients have been given a temporary reprieve: CPMC1 relented and will keep them, at least through June 30, 2018, or perhaps longer. But CPMC/St. Luke’s won’t admit any new patients needing sub-acute care, leaving San Francisco with the problem of no sub-acute care facility anywhere else in the City. The recent Board of Supervisors and Health Commission hearings on the proposed closure of St. Luke’s SNF and sub-acute units are important historical records. This expanded article — admittedly very long — is intended to help preserve the historical record. Still unanswered is what will future generations of San Franciscans who need sub-acute level of care do? Where will they go? Will they continue to be dumped into out-of-county facilities? Up next, CPMCs plans to close its 25-bed Alzheimer’s residential care unit in 2018 on its California Street campus is simply more corporate cruelty, and similarly obscene. When California Pacific Medical Center (CPMC) — a Suter Health affiliate — notified the City last June that it planned to close the sub-acute and skilled nursing units at CPMCs St. Luke’s campus at the end of October, the Health Commission was required to hold two hearings under the 1988 ballot measure known as “Prop. Q” on any closure or reduction of services provided by public-sector hospitals. The Commission held its first Prop. Q hearing on the St. Luke’s closure on August 15 and its second hearing on September 5. The two hearings are archived on SF GOV-TV at http://sanfrancisco.granicus.com/ViewPublisher.php?view_id=171. Both are compelling viewing. SF GOV-TV broadcasts and archives videos of many of the City’s boards, committees, and commissions that can be accessed at http://sfgovtv.org/. Both hearings were well attended by family members and former patients of St. Luke’s, who provided gripping and heartbreaking testimony. Additional testimony was provided by a good number of community advocates who had formed a loose coalition of dedicated and smart activists to support St. Luke’s patients and their family members. 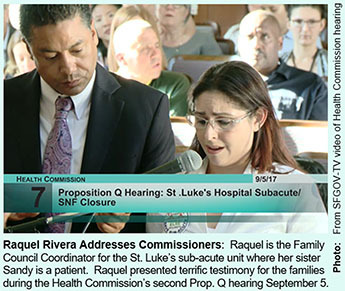 Raquel Rivera, whose sister Sandy is a St. Luke’s sub-acute patient, was allowed to make an extended opening presentation to the Health Commission on September 5 in her role as the Family Council Coordinator for St. Luke’s sub-acute unit, a presentation well researched and delivered. Ms. Rivera began her presentation recounting the situation Raymond Orello — a sub-acute patient of nine years at St. Luke’s Hospital — faced when he was transferred in July to a facility in San Jose. Raquel asked Raymond where his family was, and he stated they are all in the cemetery. He felt pressured to move from St. Luke’s because a social worker appeared in his room with a priest. She told him the longer he waited, the further he’d have to go, perhaps as far as Sacramento, so he felt that he had no choice. Orello indicated that since his move to San Jose, his health has deteriorated, and he’s in a lot of discomfort. In one incident at the new facility, the tube providing him oxygen disconnected and fell on the floor, and he couldn’t breathe. He banged on the side of the bed for help and a nurse came and re-connected his life support. He was told that if he needs different oxygen equipment, he would have to leave to another facility. He said he no longer has the will to live and he is just waiting to die. Orello’s story is one example of “transfer trauma,” which is known to increase morbidity and mortality from the trauma of being relocated, Raquel said. 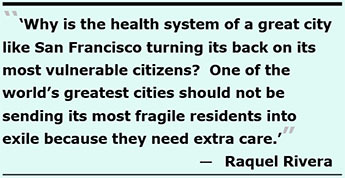 Raquel noted that moving these critically-ill patients out of San Francisco would be detrimental to their health with the uncertainty of a new location and skilled nursing staff. It would leave extremely medically-fragile patients stranded in another community many miles away from family and friends. “They will die as they will no longer be in their familiar surroundings receiving the same level of care from staff and support from their families,” Rivera testified. Among other points she raised in her presentation, Raquel provided recommended solutions to the Health Commission on behalf of the family council, including: Sub-acute care needs to be provided in the City and County of San Francisco; sub-acute facilities must be hospital-based, with an equivalent intensity of care as is now provided at St. Luke’s; and any sub-acute facility needs to be easily accessible by public transportation. Two weeks later, Ms. Rivera submitted a letter to the San Francisco Board of Supervisors on September 19 indicating that the Family Council also believes St. Luke’s sub-acute unit should remain open to admitting new patients. The Mission Local newspaper reported on September 4 that CPMCs CEO, Dr. Warren Browner2, had asserted during a St. Luke’s Family Council meeting on August 31 that patients in St. Luke’s SNF and sub-acute units had been “privileged” to have been patients there. For his part, Rick Vallejo — who works at St. Luke’s, and his sister has been a patient there for six years — testified that when he left that August 31 meeting with Browner he had felt insulted by Browner’s crass statement that the family members should feel grateful that their relatives were patients all that time. Rick said his hope was shot. Benson Nadell, San Francisco’s Long-Term Care Ombudsman, presented terrific testimony on September 5 to the Health Commission on the sub-Acute and SNF units closure at St. Luke’s, noting that the Mayor’s Long-Term Care Coordinating Council has been “confused,” “enthralled,” and “under the spell” of various policy initiatives since 2004, which led indirectly to the consequence that CPMCs business plans were driving closure of St. Luke’s SNF and sub-acute units. Nadell implied the focus of the Department of Public Health and the Post-Acute Care Collaborative (PACC) have confounded issues, noting “post-acute care isn’t long-term care, or focused on chronic disease management,” particularly for the many patients having complex medical conditions. Nadell stopped short of indicating it was San Francisco’s Health Commission itself that recommended in the Prop. Q Resolution it adopted on May 19, 2015 in response to the closure of St. Mary’s 32-bed SNF unit, that a Post-Acute Care Project work group be formed to research skilled nursing and post-acute care services, and to identify gaps in post-acute care services. The Health Commission itself has confounded issues. 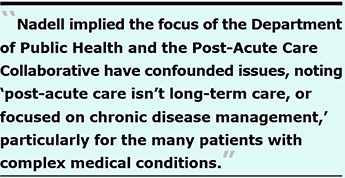 The Health Commission must know that “post-acute care” is not the same thing as “long-term care”! And the “gaps” have worsened since. Other speakers also expressed similar outrage over Browner’s insensitive remarks that patients had been “privileged” to be at St. Luke’s. The draft of the Health Commission’s September 5 meeting minutes summarized remarks made by Dr. Ken Barnes, a physician who has worked at St. Luke’s in its sub-acute and skilled nursing facility (SNF), who stated that “SNF beds in San Francisco are disappearing at an alarming rate.” Barnes urged San Francisco’s Department of Public Health (DPH) and the Health Commission to undertake a determined effort to plan for the addition of new SNF and sub-acute beds in San Francisco. The meeting minutes only summarized Dr. Gary Birnbaum, Medical Director of the St. Luke’s Hospital sub-acute unit as having testified “the patients and community should be protesting directly to Sutter since that is where the authority lies. He urged the CEO of Sutter to be held accountable by the Health Commission.” In fact, Birnbaum said much, much more. Dr. Birnbaum had clearly testified that perhaps the community activists and family members of patients were talking to the wrong people, and that Dr. Browner takes his marching orders from Sutter Health. Birnbaum said St. Luke’s executives are not in the position to make any decisions with the Health Commission. Birnbaum testified that CPMCs executives had always intended to close St. Luke’s sub-acute and SNF units, reporting executives had walked into his office 12-and-a-half years ago announcing that the SNF and sub-acute units would be closed within a year. Dr. Birnbaum said that what he thinks the Health Commission needs to do is to invite the person from Sutter Health who could make a decision, and that’s Sara Krevans, CEO of Sutter Health. “It is Krevans and administrators under her who are making the decisions here, and they’re the only people the Health Commission should be dealing with if the Commission wants to do anything. Otherwise we’re all spinning our wheels,” Birnbaum testified. A significant portion of Birnbaum’s testimony was creatively elided — completely omitted — from the Commission’s meeting minutes, as a result of the sanitized editing by the Health Commission’s secretary, Mark Morewitz. The draft minutes also report that Bob Prentice, Gordon Mar, and Jane Sandavol spoke on behalf of San Franciscans for Healthcare, Housing, Jobs, and Justice (SFHHJJ). The three addressed the severity of the patients’ medical conditions and reminded the Health Commissioners that the support of families and loving staff is vital to these patient’s survival. Many other St. Luke’s staff and nurses, other physicians, family members, and a host of community advocates also presented compelling testimony to the Health Commission during both the August 15 and September 5 Prop. Q hearings. Leading up to the September 5, 2017 Health Commission Prop. Q hearing on the closure of St. Luke’s sub-acute and SNF units, many observers worried that Health Commission president Edward Chow, MD would repeat the same stunt he pulled in 2015 during the Prop. Q hearing on the closure of St. Mary’s 32-bed SNF unit, falsely claiming that the Health Commission did not need to take an up-or-down vote on whether St. Mary’s SNF closure would, or would not, have a detrimental effect on the healthcare of San Franciscans. Luckily, Chow didn’t repeat that same blather during the September 5, 2017 Prop. Q hearing on the closure of St. Luke’s sub-acute and SNF units. The Health Commission finally got it that SNF capacity for future generations of San Franciscans remains a huge unresolved issue! But the Health Commission’s additional RESOLVED clause didn’t go far enough, because despite catcalls from the audience (during debate on the motion to add the additional clause) that the additional RESOLVED clause should stipulate that any alternative facilities must be located in San Francisco, the Commission refused to budge and in the Resolution, it finally adopted, it refused to explicitly state on the record that alternative facilities must be located in-county! The Health Commission commendably did the right thing, ruling in Resolution 17-7 that it adopted on September 5 that the closure of St. Luke’s sub-acute and SNF units will indeed have a detrimental effect on the provision of healthcare to San Franciscans. A week after the Health Commission adopted its Resolution 17-7 finding that the closure of St. Luke’s sub-acute and SNF units would in fact have a detrimental effect on San Franciscans healthcare, the Board of Supervisors stepped in on September 12 and held a “Committee of the Whole” (CoW) hearing on St. Luke’s at the urging of Supervisors Ahsha Safai and Hillary Ronen, rather than waiting for several weeks to hold a second hearing before the Supervisors Public Safety and Neighborhood Services Committee, as it first had on July 26. To everyone’s surprise, although CPMC had been adamant during the Health Commission’s September 5 hearing that CPMC would not keep the two St. Luke’s units open, the day before the Board of Supervisors CoW hearing CPMC suddenly relented and announced to St. Luke’s patients and family members and to the Board of Supervisors that CPMC would keep the two St. Luke’s open, at least until June 2018 — and perhaps for the term of the patient’s lives, but with no written guarantee. From my perspective, that’s because the Board of Supervisors had not been paying attention to the crisis of the disappearing number of SNF beds and facilities as the crisis unfolded. Also during opening comments during the CoW hearing, Supervisor Jeff Sheehy noted that during the rebuild of Laguna Honda Hospital “we knew then that [the City] was projecting a shortage [of] skilled nursing beds, and the reality is that instead of building [additional] capacity, we’ve been shrinking capacity.” For her part, Supervisor Sandra Lee Fewer noted that during the July 26 Public Safety hearing she had questioned the lack of skilled nursing beds, and that she had “also questioned why when we re-built Laguna Honda [Hospital] [the City] did not include sub-acute beds.” Fewer said she believes the City has a social responsibility to include that level of care within the City’s public health facilities. But during opening comments, Supervisor Norman Yee’s remarks were somewhat worrisome. He indicated he asked “for a hearing on these issues” last June, ostensibly referring to SNF and sub-acute level of care facilities. Yee had not. Instead, Yee asked last June for a hearing to “understand the efforts of City departments regarding institutional housing, particularly assisted living, residential care facilities, and small beds for seniors in San Francisco.” Those are separate issues from the issues of sub-acute and SNF level of care. While those residential care facilities are clearly important — and rapidly vanishing in San Francisco — the difference between medical-based SNF and sub-acute facilities, vs. non-medical residential care facilities is significant. While both settings are clearly necessary, they are not the same issues. Some observers worry Yee drank too much of the Health Commission’s Kool-Aid®. Yee also noted during his opening remarks on September 12 that San Francisco may need to look at the SNF and sub-acute shortage as a regional issue, using the same phrasing as Health Commissioner Edward Chow. Yee is clearly right that San Francisco has the fewest number of beds for any kind of both levels of care for the City’s aging population. Additional discussion about Supervisor Yee’s proposed hearing follows, below. Following Yee’s remarks, Director of Public Health Barbara Garcia was asked to comment. She indicated that DPH has been part of the PACC since its inception and DPH is also “leading with the Hospital Council.” Then Garcia stumbled, presenting misinformation to the Board of Supervisors. Garcia wrongly stated that due to the amount of money the City received for the 1999 bond measure to rebuild Laguna Honda Hospital, the rebuild of LHH was reduced from 1,200 beds to just 780, implying the bond had not been large enough. Nonsense! Then she said LHH had lost 200 SNF beds, when, in fact, it had lost 420 beds. Garcia failed to tell the Supervisors that it was the massive cost overruns and change orders3 on the LHH rebuild — not the initial amount of the bond — that resulted in the one-third reduction of beds at LHH. So much for revisionist history! Garcia regurgitated the PACCs, the Health Commission’s, and Yee’s assertion that a “regional solution” should be reached, particularly for sub-acute care — portending even more out-of-county discharges. She indicated she is already in conversations with San Mateo County to develop regional solutions, and claimed DPH is “looking at” continuing to save SNF units in San Francisco. She also indicated DPH is working with Dignity Health (not Sutter Health/CPMC) on trying to develop a sub-acute unit, but only for mental health patients. DPH and the PACC do not appear to be looking for solutions for sub-acute patients whoo do not have a mental health diagnosis. Supervisor Safai called on David Serrano Sewell, the Hospital Council’s regional vice president. The audio file of the Supervisor’s September 12 hearing shows Sewell noted the Hospital Council represents the collective interests of both private, non-profit hospitals and public hospitals. Sewell confirmed to the Board of Supervisors that the PACC is currently only focused on two vulnerable patient populations discussed below. When Safai asked Sewell about whether a survey and analysis of available hospital beds and available infrastructure has yet been conducted, like an artful-dodger Sewell didn’t answer the question directly, but said the PACC and the Hospital Council are “committed” to work on that analysis. When asked to present testimony to the Board of Supervisors, Browner went on to say that because St. Luke’s is the only provider of sub-acute care in San Francisco, CPMC was looking to out-of-county facilities to “transition” its patients to. He later suggested it had proved to be too challenging, and CPMC had decided the day before the Supervisors hearing to keep the current patients in-county. When pressed, Browner said CPMC is committed to keeping the patients in-county at a CPMC campus, but apparently only for existing — not new — patients who need sub-acute care level of services. When pressed later during the hearing, Browner confirmed that CPMC is making a commitment only for caring for current St. Luke’s patients. 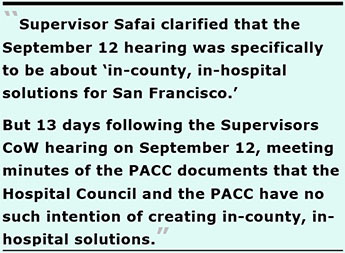 But Browner, Sewell, and Garcia may well have been misleading Safai, because 13 days following the Supervisors CoW hearing on September 12, meeting minutes of the PACC documents that the Hospital Council and the PACC have no such intention of creating in-county, in-hospital solutions (discussed below). Safai next called on Raquel Rivera, the St. Luke’s Sub-Acute Family Council coordinator, and Dr. Ken Barnes to make opening presentations, both of which were terrific. Safai then opened up the September 12 hearing for public comment, all of which was compelling, and worth viewing on SF GOVTV. Notably, Kimberly Tavaglione, a labor organizer for the National Union of Healthcare Workers (NUHW) , testified that she has a problem with the Hospital Council “policing” themselves, since there is no input to the Hospital Council from public comments, and she’s worried the Hospital Council will come up with a bogus solution (via the PACC) to the shortage of SNF beds in-county. Yee claimed he was looking for a more “comprehensive” hearing, which is almost comical since the lack of sub-acute care and SNF beds in the City is — and has long been — a complete humanitarian crisis. That alarmed some observers, who rightfully worry about splitting the focus from sub-acute and SNF in-county, in-hospital solutions by adding a distinct, yet interrelated, issue. Yee was referring to a hearing he had requested on June 28 regarding “institutional housing for seniors,” including assisted living and residential care facilities, which is clearly also a problem. But by far, the biggest problem facing the elderly and disabled people is the lack of skilled nursing facilities and sub-acute units in San Francisco that causes them to be dumped out-of-county in massive numbers. The two separate issues should not be confounded or conflated. The focus should remain on sub-acute and SNF in-county, in-hospital solutions, not adding Yee’s distinct, separate issue. Yee went on to say he had texted Supervisors Ronen and Safai about working together so that the three Supervisors didn’t step on each other’s toes. But a subsequent records request to Ronen and Safai uncovered no such text messages from Yee to either Ronen or Safai. Yee’s concerns — and the very real worry about splitting various constituencies and distracting from the central issue about the lack of SNF and sub-acute level of care — are discussed in more detail, below. By conflating and confounding the two separate issues into a single hearing, what could possibly go wrong? The CitizenAudit.org website shows the Hospital Council of Northern and Central California is a business and professional organization registered as a 501(c)(06) “Business League” entity established in March 1965 (EIN # 94-1533644). The Hospital Council’s own web site shows that it is a non-profit hospital and health system trade association established in 1961 (not in 1965), representing 185 hospitals and health systems in 50 of California’s 58 counties. The Hospital Council’s web site acknowledges that it is supported in part by the Healthcare Foundation of Northern and Central California, which is a separate 501(c)(3) non-profit public charity (like CPMC itself) supporting the Hospital Council. The CitizenAudit.org web site reports that the Hospital Council had revenue and income of $4,743,392 as of December 2015, and had $7,135,597 in assets as of December 2015. It’s not yet completely clear how much the Hospital Council charges its member hospitals in annual membership fees. When David Serrano Sewell, the Hospital Council’s regional vice president, was asked to provide information on the annual membership fees and dues structure charged its members hospitals, he did not respond to the information request. However, the Hospital Council’s IRS Form 990 tax return shows that the Council had received $2,756,664 in membership dues on total revenue of $3,872,397 for the period ending December 31, 2014 (which total revenue grew to $4.7 million ending in December 2015). 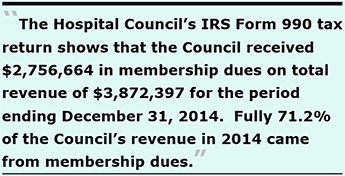 In other words, fully 71.2% of the Council’s revenue in 2014 came from membership dues. Of interest, the Hospital Council’s President and CEO, Art Sponseller, was paid $392,017 in total compensation for 2014. Not a bad gig, if you can get it. DPH confirmed in response to a records request that in FY 2016–2017 (ending June 30, 2017), San Francisco paid $392,539 in membership dues for our two public hospitals (SFGH and Laguna Honda Hospital) to the Hospital Council, the majority of which was for SFGH’s membership dues, plus another $20,000 for SFGH’s portion of the fees for the initial “Post-Acute Care Project” report. It’s not yet known whether either of the two public hospitals will be charged more for the second “Post-Acute Care Collaborative” report that is ongoing. When membership dues are finally paid for FY 2017–2018, will San Francisco’s two public hospitals have paid over $1 million in fees to the Hospital Council over this three-year period? What is the City getting in return? Why on top of annual membership dues does the Hospital Council charge its member hospitals additional fees for such things as the Post-Acute Care Project for its February 2016 report to the San Francisco Health Commission, “Framing the Post-Acute Care Challenge Report”? Were the private-sector, non-profit hospitals also charged separate fees to support the Post-Acute Care Project in drafting the February 2016 “Framing the Challenge” report? If so, how much were they charged? How many of those hospitals ponied up to support the first Post-Acute Care Project and its initial report? Because the first Post-Acute Care Project ostensibly ended in December 2015, when the ancillary follow-on Post-Acute Care Collaborative was formed, have both the public hospitals and private-sector non-profit hospitals in San Francisco been assessed additional fees by the Hospital Council on top of their annual membership dues to support on-going work of the PACC, and will they be charged additional fees when the PACC eventually delivers its “final” report to San Francisco’s Health Commission in November or December 2017, or perhaps sometime in 2018? 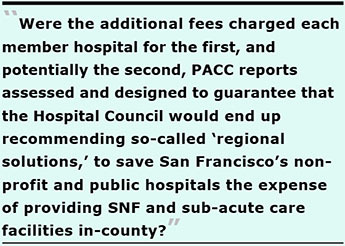 Were the additional fees charged each member hospital for the first, and potentially the second, PACC reports assessed and designed to all but guarantee that the Hospital Council would end up recommending so-called “regional solutions,” to save San Francisco’s non-profit and public hospitals the expense of providing SNF and sub-acute care facilities in-county and to allow those hospitals to continue dumping patients out-of-county via a creative “regional” approach? Where Did the PACC Come From? It’s not entirely clear how the Post-Acute Care Collaborative (PACC) was formed as an advisory body to the City, or who it reports to. It’s a so-called public-private partnership formed to make recommendations to the Health Commission and DPH on options for post-acute care services (any level of care following hospitalization) in San Francisco. Here we are in December 2017 with no concrete recommendations that were due to the Health Commission by December 2016. Unfortunately, the Health Commission’s Resolution 15-8 focused only on the need for short-term, not long-term, SNF care, as if the Commission still doesn’t get it! Three months after Resolution 15-8 was adopted, the San Francisco Post-Acute Care Project (alternatively referred to as a “Task Force”) was launched by DPH in August 2015. The project concluded in December 2015 issuing the “Framing San Francisco’s Post-Acute Care Challenge,” report which addresses the impact of reduced skilled nursing facility beds on the need, supply, and gaps in post-acute care in the City, now and into the future. 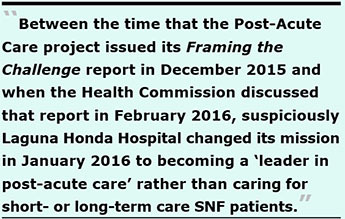 The Framing the Post-Acute Care Challenge report was not heard by the Health Commission until February 2016. Suspiciously, and oh-so-conveniently, LHH’s new mission statement adopted on January 12, 2016 suddenly changed its mission from caring for long- and short-term care SNF patients to LHH becoming a “leader in post-acute care.” Completely absent from the January 2016 revised mission statement is any mention of long-term care, short-term care, or rehabilitation services, all of which were completely excised from LHH’s mission statement. Changing the mission of LHH, SFGH, or DPH does not require approval from the Board of Supervisors or City Hall, who may not even be informed when the various mission statements are changed. What a (not-so-amazing) coincidence that in May 2015 the Health Commission turned to focusing on post-acute care, the Post-Acute Care Project finished writing its initial report about post-acute care in December 2015, and then LHH suddenly changed its mission statement in January 2016 just before the Health Commission heard the “Framing the Challenge” report in February 2016. LHH’s mission change was no mere coincidence; it appears to have been politically timed. Having the Hospital Council lead the work of the PACC is like the fox guarding the hen house: First, the Hospital Council charges its member hospitals exorbitant membership dues to protect the various hospitals bottom-line profit margins. Then the Hospital Council’s PACC recommends that no hospital-based SNFs in-county are necessary for post-acute care, and just stuffing patients into SRO’s either out-of-county or in-county is all that is required. Saves all of the hospitals — including San Francisco’s two public-sector hospitals — tons of money after they’ve paid their membership dues to have the Hospital Council ghost-write the PACC reports! Mysteriously, although the Post-Acute Care Task Force had officially ended when it presented its December 2015 report, a new group was formed known as the Post-Acute Care Collaborative (PACC) to continue previous efforts of the Post-Acute Care Project to provide advisory and policy recommendations to DPH and the Health Commission. The PACC was created to explore incentives to address gaps in institutional care and to bring new SNF, Residential Care Facilities for the Elderly (RCFE), and sub-acute providers to the market. The PACC appears to be a policy-generating, or policy-recommending body, as an “advisory” body or an advisory committee. 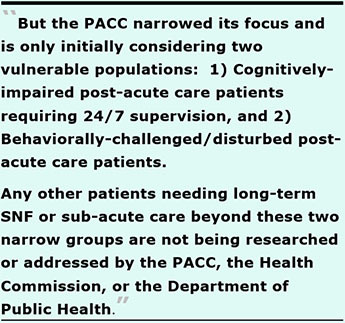 But when the PACC began to meet, it narrowed its focus and is only initially considering two vulnerable populations: 1) Cognitively-impaired post-acute care patients requiring 24/7 supervision, and 2) Behaviorally-challenged/disturbed post-acute care patients (including mental health diagnoses, dementia, traumatic brain injury, and perhaps others), and other behaviorally-challenged patients with any other diagnosis. The PACC is recommending placing the two vulnerable patient populations into Single-Room Occupancy (SRO) hotels, or into Board-and-Care (B&C) facilities. How do you provide 24/7 care for a patient with dementia in an SRO? Any other patients needing long-term SNF or sub-acute care beyond these two narrow groups are not being researched or addressed by the PACC, the Health Commission, or the Department of Public Health. It’s thought the Hospital Council of Northern and Central California launched the PACC in March of 2017, possibly as a self-appointed body to provide advisory and policy recommendations to the Health Commission and the City. It’s also thought the PACC reports to both the Hospital Council and to the Department of Public Health. The issue of who created the PACC and who the PACC reports to is germane simply because the PACCs meetings — and meetings of the Post-Acute Care Task Force before it — have not open to members of the public who have not been permitted to attend and observe their meetings. Both post-acute care bodies developing recommendations have held all of their meetings, essentially, behind closed doors. There you have it: Even before the PACCs final report is issued, the PACC appears to be headed into recommending that additional SNF bed capacity be developed on a “regional” (read “out-of-county”) basis, with a vague promise that if additional skilled nursing facility capacity becomes available, then those patients dumped out-of-county might be offered a chance to return to San Francisco. The key words here are “might be offered.” I’ll believe it when I see it. 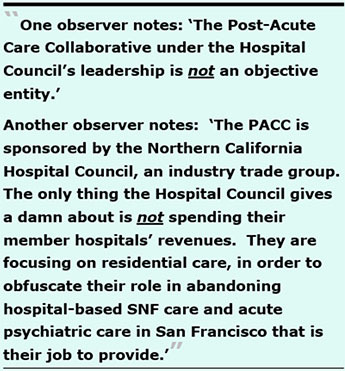 And the PACC clearly suggested on September 25 that instead of focusing on quickly opening any sub-acute unit in San Francisco proper, the PACC is fine with an “interim measure” of continuing to dump sub-acute patients, along with SNF patients, out-of-county. Oh, the power of paying those membership dues to the Hospital Council! Poor Supervisor Safai was completed bamboozled by the Hospital Council and the PACC during the Board of Supervisors Committee of the Whole hearing 13 days earlier! Here we are in December 2017, fully two years after the Post-Acute Care Project was launched in 2015, with little to show for intervening meetings and research, and continuing recommendations to the Health Commission. 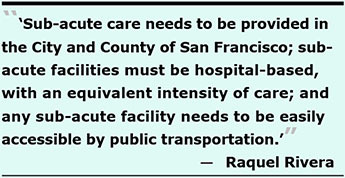 The PACC has chosen to focus only on the post-acute care needs of two narrow groups of “vulnerable” patients (discussed above), not to focus on the post-acute care needs of San Francisco’s broader population. The PACCs final recommendations are not expected to be presented to the Health Commission until January 2018, assuming no further delays. 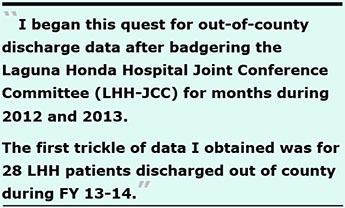 I began this quest for out-of-county discharge data after badgering the Laguna Honda Hospital Joint Conference Committee (LHH-JCC) — a subcommittee of the San Francisco Health Commission — for months during 2012 and 2013 to release public records on the number of LHH patients discharged out of county. The then-chairperson of the LHH-JCC was Health Commissioner David Sanchez, who finally agreed during the LHH-JCC’s November 21, 2013 meeting that LHH would begin reporting out-of-county discharge data beginning in January 2014, mid-year into FY 13-14. The first trickle of data I obtained was for 28 LHH patients discharged out of county during FY 13-14. Back in April 2016, I wrote another article, “Skilled Nursing Bed Shortage Worsens,” that first presented out-of-county discharge data from our two public hospitals: LHH and SFGH. That article reported the total out-of-county discharges then stood at 161 just for three-and-a-half fiscal years (FY 12-13, FY 13-14, and FY 14-15, and the first six months of FY 15-16 through December 2015). I continued to push DPH between 2013 and 2017 to provide more complete data. On September 11, 2017 DPH provided corrected data for two years that had previously appeared to have been outliers. The number of out-of-county discharges from just public hospitals then stood at 605 discharges on September 11 at minimum, excluding three fiscal years of out-of-county discharges from SFGH between FY 06-07 and FY 08-09, and excluding private-sector hospital’s out-of-county discharges. On November 27, DPH provided additional data showing out-of-county discharges including from private-sector hospitals had climbed to 1,381 discharges, which is still preliminary, since St. Francis, St. Mary’s and Kaiser haven’t yet responded to DPH’s survey by the requested deadline. 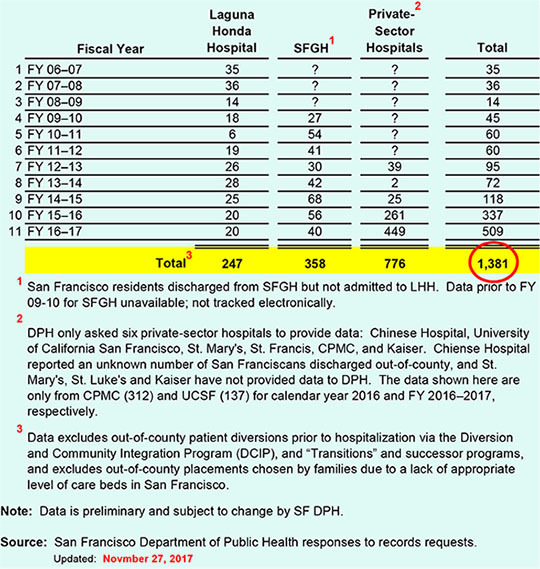 For the eight years of SFGH data that has been reported, SFGH averaged 44.8 SFGH out-of-county discharges in each year. Applying that average to the missing three years of data — assuming the averages remain constant — would add another 134 out-of-county SFGH discharges, to a more probable total of 739 such discharges from just the City’s two public hospitals. And notably, DPH’s then- and current-Transitions Manager, Kelly Hiramoto, claimed to then-Supervisor David Campos on May 29, 2014 that DPH had no way of ascertaining this data because “a database” had not worked as designed. DPH’s then-Public Information Officer, Nancy Sarieh, claimed on June 9, 2014 that the database that had not worked as designed was the SF GetCare database (casting reputational harm against RTZ Associates that had designed the database), which I knew in 2014 to be complete nonsense because the SF GetCare database had been prototyped from a database I had helped develop for over a decade while an employee at LHH that I knew contained discharge destinations. It is discouraging to report that the delayed release of this data for earlier years — which data remains incomplete — occurred due to errors and omissions by Transitions Manager Hiramoto. She is also now providing data to the Post-Acute Care Collaborative (PACC) and the Hospital Council of Northern and Central California, essentially a trade group, that is developing recommendations only for a small subset of vulnerable patients who need sub-acute care. The Health Commission has been relying upon this trade group of hospital administrators to guide DPH on expanding post-acute care facilities in San Francisco, but the PACC tried to omit any quantitative information about out-of-county discharges from private hospitals prior to DPH releasing preliminary data on November 27. The PACC’s reticence soon changed. Following additional badgering, DPH’s Policy and Planning Department announced on September 5 that it had requested out-of-county discharge data from private-sector hospitals. When DPH’s new public information officer, Linda Acosta, finally provided LHHs data for the six-year period between FY 06-07 and FY 11-12, she confirmed the data for those six years had, in fact, been culled from the SF GetCare database, showing Hiramoto and/or Sarieh had lied — however inadvertently — to then-Supervisor Campos! It is incumbent on the Board of Supervisors to require that all of the private-sector hospitals — including St. Francis, St. Mary’s, and Kaiser — provide data on all out-of-county discharges of San Francisco residents in order to gain an historical context of just how severe this problem has been back to FY 06-07 from all hospitals in the City. We must not lose sight of just how severe the out-of-county discharge epidemic has grown, because if San Francisco does not add additional in-county capacity quickly as San Francisco’s aging population mushrooms in the coming years, there will be many, many more people simply evicted, exiled, and dumped out of county. It’s abundantly clear Pating had stuck his foot in his mouth in February 2016 advocating for even more out-of-City and out-of-county discharges. Really, Dr. Pating? More out-of-county patient dumping, including elderly and disabled San Franciscans desperately needing long-term care skilled nursing care? How’s that for a Health Commissioner charged with supporting the Department of Public Health’s mission to protect and promote the health of all San Franciscans? Now that DPH released on November 27 preliminary private-sector hospital out-of-county discharge data, the 1,381 San Franciscans already dumped out-of-county may soar again if DPH eventually obtains out-of-county discharge data from St. Mary’s, St. Francis, and Kaiser hospitals. In April 2016, the Westside Observer newspaper reported in “Skilled Nursing Bed Shortage Worsens” (linked above) that a February 2016 document presented to the Health Commission — “Framing San Francisco’s Post-Acute Care Shortage” that reported in the 14-year period between 2016 and 2030, San Franciscans aged 65 and older will comprise 20% of San Francisco’s population by 2030, increasing by 69.9% between 2016 and 2030 — from 113,000 in 2016 to 192,000 by 2030. 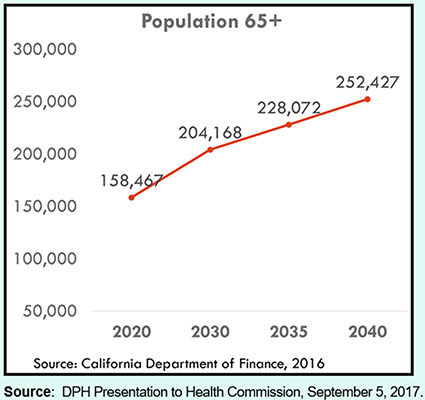 However, on September 5, 2017 DPH’s Office of Policy and Planning presented a new PowerPoint presentation to the Health Commission indicating that the number of San Franciscans over the age of 65 would increase to 252,427 by 2040 shown in Figure 1. Compared to the estimated 113,000 San Franciscans over the age 65 in 2016, the September 2017 presentation projects a 123.4% change increase (to 252,427) — not just a 69.9% increase — over the next 23 years. While the initial DPH presentation on March 27, 2017 on behalf of what was to become the PACC recommended exploring new incentives and funding options to address current gaps in institutional care and to bring new SNF, Residential Care Facilities for the Elderly (RCFE), and sub-acute providers to the market, the PACC has not presented any recommendations regarding closing gaps in institutional care, and has instead focused solely on examining only post-acute care for a very limited number of “vulnerable” populations in community settings. Neither the PACC, the Health Commission, or DPH have presented any information or proposals to date to bring new SNF and RCFE facilities to market — more than two years following adoption of the Health Commission’s Resolution 15-8 in May 2015. The PACCs stated purpose claims it is to improve availability of community-based long-term residential care — not SNF-based care — for “some” patients who would otherwise be placed in a SNF. Placing patients who need 24/7 nursing care and round-the-clock custodial care in SRO’s and B&C’s — particularly those with dementia’s, traumatic brain injuries, mental health diagnoses, or who are cognitively impaired — almost guarantees that they will not receive the appropriate level of care that they need, and is inhumane. 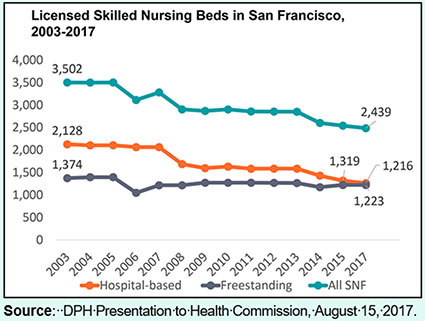 DPH’s August 15 presentation noted that since 2003, there has been a 30.4% decline in SNF beds overall in San Francisco (from 3,502 beds to just 2,439 beds), largely due to the reduction of hospital-based SNF beds that has fallen from 2,128 to 1,216 beds, a 42.9% decline shown in Figure 2. And this is even before we have a 123.4% change increase in the number of San Franciscans over the age of 65 who are more likely to need SNF level of care as they (and I) age. Twenty years ago, the San Francisco Section of the Hospital Council of Northern and Central California’s West Bay Hospital Conference, presented a study in May 1997 to investigate the relationship between the future supply and demand for nursing facility beds in San Francisco in its report “San Francisco Nursing Facility Bed Study: Comprehensive Report Summary.” The Hospital Council hasn’t updated its 1997 report since then. The Hospital Council’s 1997 study was considered a “capacity analysis,” not a financial analysis. The study concluded that San Francisco faced a 4,207 SNF bed deficit by the year 2020, and a separate “White Paper” authored by former Director of Public Health, Mitch Katz in 1998 projected the same deficit. DPH’s Colleen Chawla presented the Health Commission with a compelling analysis dated June 12, 2014 that projected a shortage of 700 SNF beds in San Francisco. 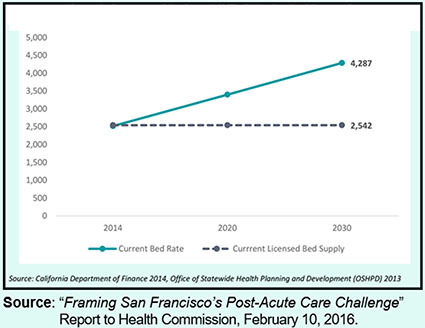 Just a year-and-a-half following Chawla’s June 2014 analysis, the February 2016 “Framing San Francisco’s Post-Acute Care Challenge” report to the Health Commission noted the projected shortage of SNF beds at 1,745 as shown in Figure 3 (4,287 projected demand minus the current supply of SNF beds). How did this shortage increase by 1,000 — from 700 to 1,745 — between June 2014 and February 2016? And how did Chawla reduce the projected deficit of 4,207 SNF beds in the Hospital Council’s 1997 study to just a 1,745 bed deficit? Could both the Hospital Council’s 1997 study and Dr. Katz’s 1998 study have been horribly wrong at the time they were issued? It’s crystal clear the need for, and demand for, SNF level of care isn’t going away, and over the past 20 years, San Francisco government officials have done nothing to mitigate this looming disaster of an insufficient number of SNF beds to meet demand. City officials have, instead, just turned a blind eye to the escalating out-of-county patient dumping, since DPH defers to the Hospital Council and the PACC at every step of the way. Yet to come is another looming fight over CPMCs plan to close its 25-bed Alzheimer’s unit in 2018 — the Irene Swindells Alzheimer’s Residential Care Program, licensed to Sutter West Bay Hospitals (d.b.a. CPMC) as a Residential Care Facility for the Elderly (RCFE) — at CPMCs California Street campus. It is thought the Swindells RCFE charges between $6,500 and $9,000 per month (which translates to $78,000 to $108,000 annually), clearly out of reach of most San Franciscans. It is mostly for private-pay patients, not Medicare or Medi-Cal patients. The Swindells program was first licensed to CPMC 20 years ago, on March 28, 1997. On July 10, 2017 representatives from the Community Care Licensing Division of the State of California’s Department of Social Services met with Sutter Health’s Robert Sarison to discuss the future of CPMCs Alzheimer’s facility due to the planned closure of CPMCs California hospital campus being sold to fund construction of its new “destination” hospital on Van Ness Avenue. The purpose of the July 10 meeting was to discuss submission of CPMCs Notice of Closure packet, its 60-day Eviction Letter to patients, and CPMCs relocation plans for the Swindells facility’s current residents. The Licensing Division’s July 10 Facility Evaluation Report noted that of the current 23 patients at the Irene Swindells facility, four are patients in its hospice unit. How much shameless audacity does CPMC have to issue eviction letters to hospice patients? Obviously, eviction amounts to one form of elder abuse. On August 8, the Family Council of the Swindells facility met with CPMC CEO, Dr. Warren Browner. The Family Council’s September 25 letter to Browner is heartbreaking. The letter notes San Francisco provides great privileges to CPMC, and in return the City counts on CPMC to provide a full continuum of care to the community, with Swindells Alzheimer’s program as a critical part of that grand bargain. The Family Council’s letter notes that CPMCs Institutional Master Plan provides services at CPMCs California Street campus would be transferred to other CPMC campuses. Although Swindells is only 24 beds in size, it has extraordinary value as a model of care for people with severe memory impairment. That model of care must be preserved. The Family Council’s letter notes CPMC has enough beds to go around, but CPMC must decide to allocate those beds taking into account community needs, rather than strictly according to CPMS’ revenue stream. Sadly, the Family Council’s letter notes that CPMC has “already begun to close Swindells by artificial attrition,” and notes beds in the Swindells program now remain unused when they are rendered vacant. The Family Council asserted that CPMC is extinguishing Swindells through deliberate attrition. The Swindells’ Alzheimer’s program is another victim of CPMCs profit-driven decision-making, just like CPMCs SNF and sub-acute closure at St. Luke’s is. The Swindell’s program is a state-of-the-art Alzheimer’s residential care facility, and like sub-acute, CPMC should commit to maintaining both facilities permanently. Yee’s hearing request sought to explore issues involving a broad spectrum of “senior housing” issues, including assisted living facilities, institutional housing, residential care facilities, and small beds [six-bed board-and-care] facilities for seniors, and other types of housing facilities available to seniors once they are no longer able to safely age independently in their own homes and communities. The report Choy was referring to — most likely a report from DAAS, not from DPH — has not been released as of this writing, nor has the final PACC report been released to the Health Commission. The PACC report was requested in 2015, and two years later in November 2017, the PACCs “final” report has also not been released. Yee’s now-scheduled December 7 hearing appears to being held before either of the reports from DAAS and the PACC have been issued. Choy noted that “the follow-up hearing that Ronen and Safai have called is more directly focused on SNF and medical facilities,” as both issues are closely related. Clearly, “non-medical” residential care facilities and “medical” facilities are not the same thing, even if inextricably linked. Supervisor Yee apparently met again with several RCFE operators in a focus group sometime during the week of November 6. Yee’s December 7 hearing will, in fact, focus on citywide Residential Care Facilities for the Elderly (RCFE) and related non-medical institutional care and other housing issues. Apparently, the PACC’s final report, or draft final report, will frame Yee’s RCFE hearing. DAAS and the Health Commission have been ineffective in protecting both SNF and residential care beds, and have allowed “splitting” — developing an anti-SNF bias in order to pit funding for more home and residential care at the expense of funding SNF beds. This has not lead to stable funding for anything, and both are needed as San Franciscans continue to age. While the shortage of residential care facilities is just as crucial as the shortage of SNF and sub-acute care facilities, they are not “similar” issues. They’re two distinct, albeit inter-related issues, and inter-related shortages. Both issues deserve to be heard during separate Board of Supervisors hearings. 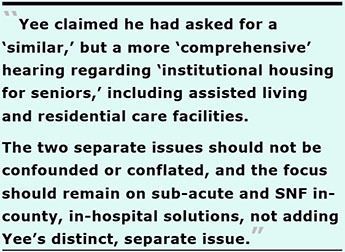 To many observers, Supervisor Yee’s focus on residential care, not hospital-based SNF care, sounds like a complete rerun, with help from the PACC in trying to “split” community advocates by focusing on supportive/residential housing for the mentally ill and behaviorally-challenged patients, while failing to address the dire need for in-county hospital-based SNF beds and the dire need for more psych beds. Any hope of Laguna Honda Hospital expanding care for dementia patients was shot down on September 12 (see Postscript, below). 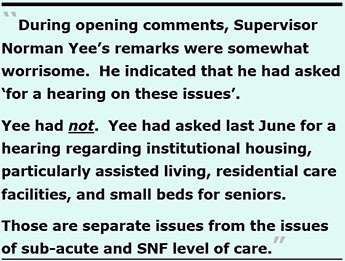 It’s abundantly clear Yee’s interest is in residential care, not on SNF level of care. Yee appears to being used by the PACC, which wants to switch the focus to residential care to obfuscate SNF services its member hospitals have removed from the community. Over the years, CPMC and other “non-profit” hospitals corporations have shut down too many psych beds and hospital-based SNF beds, and now the PACC — essentially a hospital industry trade group — is claiming the problem is just needing more residential care that public money must solve without help from the very hospitals that have actively contributed to creating the SNF-bed shortage. San Francisco has not actually integrated healthcare services. The City’s appointed entities, organizations, boards, councils, and City departments remain stuck on so-called “de-institutionalization” from hospital-based SNF beds. Advocates for community-based, rather than hospital-based, post-acute care services conveniently avoid demanding quantitative information about the number of patients shipped out of county by private hospitals who refuse to provide post-acute SNF care, sub-acute care, and rehabilitation. These advocates avoid any discussion of the repercussions of CPMC blocking admits from other hospitals to its sub-acute and SNF beds, and the historical serial shutdown by Hospital Council member hospitals of in-county SNF beds. By focusing only on residential care, these hospitals avoid discussion of their responsibilities to the people of San Francisco to provide medical care (not non-medical care) in the form of post-acute SNF care, and long-term SNF and sub-acute care on private hospital campuses. The Hospital Council’s member hospitals have strategically and deliberately picked the subject of residential care and excluded the subject of hospital-based SNF care in order to divide the community and politicians. San Franciscans concerned about the lack of an adequate number of in-county SNF and sub-acute beds and the crisis of out-of-county patient dumping need to stay focused on fighting the irresponsible behavior of CPMC and other private-sector hospitals around the loss of hospital-based SNF beds and other post-acute beds (including sub-acute facilities), and also Swindells, which is residential care for people with Alzheimer’s on CPMCs campus — because all of these services are inter-related. Folks who are very ill and need SNF beds all too often get placed — and get kept inappropriately — in residential care facilities because there’s an inadequate number of in-county SNF beds. At the same time, other very sick folks get sent to SNF facilities because there are not enough residential care facilities. Both sets of these folks all too often get dumped out of county because SNF proponents and residential care proponents are being deliberately pitted against each other, in part because the Department of Aging and Adult Services (DASS) retains its anti-SNF facility bias. You need look no further than the amount of SNF beds that will be needed in the future, which aging San Franciscans will eventually need, to understand that any reprieve from eviction and exile will not be solved until San Francisco city officials address (meaningfully) the worsening SNF and sub-acute facility crisis. The question is not whether Supervisor Safai had been listening to Yee. The relevant question is whether Supervisor Yee has not been listening to his constituents who want in-county, in-hospital-based solutions, not out-of-county patient dumping. Successive reports from the PACC over the year it has been meeting clearly show the PACC determined early in its meetings to focus only on a small subset of two post-acute care vulnerable patients: 1) Cognitively-impaired post-acute care patients requiring 24/7 supervision, and 2) Behaviorally-challenged/disturbed post-acute care patients. The iterative drafts are not presented or discussed here, and the most-recent draft of the PACC final report has not yet been completed. For its part, the PACCs draft final report indicates as its “next steps,” that a workgroup of representative “stakeholders” (i.e., including the very private-sector hospitals that have contributed to the crisis of an inadequate amount of post-acute, in-county facilities) should be convened to: “1) Develop a work plan for operationalizing selected PACC solutions; and 2) To guide and oversee implementation of the work plan.” Sounds like the PACC is looking to extend its gig, in part to extract more fees from DPH and perhaps more fees from the Hospital Council’s member hospitals. Director of Public Health Barbara Garcia apparently recognizes that the PACCs draft final report only focuses on “aging in place” community-based strategies. Reportedly, Garcia may be interested in developing an alternative group to the PACC. One of the PACCs recommendations is to use an assessment tool named “LOCUS” in each public-sector and private-sector hospital in San Francisco to facilitate discharge. The recommendation may be designed to draw attention away from, and disguise, what is actually happening. LOCUS — Level of Care Utilization System for Psychiatric and Addictions Services — is an assessment tool widely used by behavioral health managers and clinicians throughout the country to support recommendations for psychiatric and mental health patients with behavioral issues affecting their discharge placement in appropriate level of care settings. The LOCUS tool was developed by the American Association of Community Psychiatrists (AACP), with input from the American Society of Addiction Medicine. LOCUS is an assessment tool intended primarily to evaluate addicts with psychiatric illness, but can be used for those with primary psychiatric illness. It is not a tool intended for use with the elderly medically ill or for folks with a primary diagnosis of dementia-related illness/cognitive impairment from non-psychiatric causes. Interestingly, the PACCs draft final report notes that during its April 27, 2017 point-in-time survey taken for developing its recommendations, there were 117 patients waiting for post-acute care placement from the eight hospitals surveyed. Of the 117, 36 (31%) had behavioral health challenges delaying discharge (excluding SFGH patients). That means 81 (69%) did not have behavioral health challenges, suggesting using the LOCUS tool would be inappropriate. Of the 117, 26 (22%) were “substance using,” which delays discharge (excluding SFGH patients) due to restrictions by post-acute facilities that prohibit admission of active substance users. That means 91 (78%) were not substance abusers facing admission restrictions, suggesting using the LOCUS tool would also be inappropriate. By contrast, of the 117, 62 (53%) were awaiting discharge and placement because they required 24/7 supervision, and 55 (47%) did not require 24/7 supervision. It seems clear that whether or not they required 24/7 supervision, the LOCUS tool may again be an inappropriate assessment tool. Again by way of contrast, of the 117, 46 (39%) were awaiting discharge and placement because they required custodial care, and 71 (61%) did not require custodial care. This also suggests that whether or not they required custodial care, the LOCUS tool may again be an inappropriate assessment tool. The PACCs draft final report noted that in a second point-in-time survey conducted on October 5, 2017, 85 patients were waiting for post-acute care placement. Of those 85, 26 (30%) of the patients expressed that their primary desired post-acute care placement setting was to a long-term SNF. Another 20 (23%) expressed a preference for placement in a short-term SNF, and 13 (15%) expressed preference for discharge to a board and care facility. Of the 85 patients, 31 (37%) were waiting for custodial level of care placement. The draft report doesn’t stratify whether the 85 people waiting for discharge had refused out-of-county placement. Does this mean that the PACC, DAAS, and DPH have known for some length of time that many patients and their family members have actually expressed that their preference is for long-term care SNF placement, not community-based placements with so-called “services and supports? The PACCs draft final report may be the first time that the City has admitted that almost one-third of patients prefer long-term care placement in a SNF. 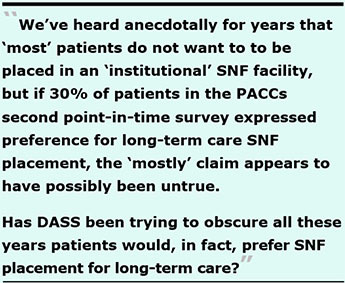 We’ve heard anecdotally for years that “most” patients do not want to to be placed in an “institutional” SNF facility, but if 30% of patients in the PACCs second point-in-time survey expressed preference for long-term care SNF placement, the “mostly” claim appears to have possibly been untrue. Has this been another hocus-pocus lie, all along? Is the PACC attempting to use sleight-of-hand deception to obscure whether the LOCUS tool is the appropriate tool? Has DAAS — in the absence of having conducted a “gap analysis” that the Board of Supervisors Budget and Legislative Analyst noted is a major failure — also been trying to obscure all these years that many patients would, in fact, prefer SNF placement for long-term care? Has the Mayor’s Long-Term Care Coordinating Council (LTCCC) also been complicit in obscuring patient preferences by failing to adequately survey client preferences? You can’t “fix” what hasn’t been measured. This is why it is so critical that a gap analysis be performed to assess and measure the gap between expressed preference for SNF facility placement and available in-county SNF capacity. Many clinicians believe, however, that the LOCUS tool may be inappropriate for numerous patients who do not have psych or behavioral symptoms — say a patient admitted to an acute hospital following a stroke who doesn’t have an accompanying psychiatric diagnosis. Alternative assessment tools, such as CARE (Continuity Assessment Record and Evaluation) developed for discharge planning in acute hospitals and for post-acute care admission and discharge, the IRF-PAI (Inpatient Rehabilitation Facility–Patient Assessment Instrument) tool, or the FIM-FAM (the Functional Independence Measure and the Functional Assessment Measure) tools, may be more appropriate tools than LOCUS. So might be the Minimum Data Set (MDS) system, used for clinical assessment of all residents in Medicare- and Medicaid- (Medi-Cal-) certified nursing homes to provide a comprehensive assessment of each residents’ functional capabilities. During the decade I supported clinicians in Laguna Honda Hospital’s Rehabilitation Services Department providing physical therapy, occupational therapy, and speech pathology treatment, they used the FIM-FAM assessment tools as the preferred instrument. It was designed for measuring disability in stroke, traumatic brain-injured, spinal cord-injured, and cancer patients to assess the functional status of rehabilitation patients, to assess whether patients are totally dependent on assistance from caregivers (level of burden of care), or are fully independent (level of independence). It is widely used in skilled nursing facilities, acute-care hospitals, sub-acute facilities, and rehabilitation facilities. LHH used it for all of its rehab patients. Using a poorly-designed screening and assessment tool mayfail to trigger a full, appropriate assessment. 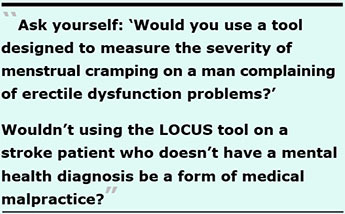 Wouldn’t using the LOCUS tool on a stroke patient who doesn’t have a mental health diagnosis be a form of medical malpractice? Hope for Return From Eviction and Exile? 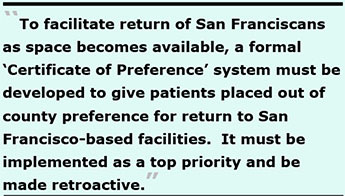 “To facilitate return of San Franciscans as space becomes available, a formal ‘Certificate of Preference’ system must be developed to give patients placed out of county preference for return to San Francisco-based facilities. Such a preference program should be prioritized for rapid development and implementation. Importantly, since DAAS and DPH have jointly funded development of the SF GetCare database developed by RTZ Associates at a cost of millions of dollars, RTZ should be awarded a contract to enhance the SF GetCare database to track the Certificates of Preference, and each private-sector hospital in San Francisco should be given access to the database and be required to use it to track ‘regional’ placements. DPH should be assigned as the lead agency to oversee governance of placement practices and protocols. It’s abundantly clear a Certificate of Preference system must be implemented as a first priority to track return-trip certificates. It is not yet known when the Hospital Council and the PACC will complete its final report and deliver it to San Francisco’s Health Commission or to the Board of Supervisors. San Francisco’s Long-Term Care Ombudsman — a State of California employee — has weighed in with various observations. First, although the City created a “Community Living Fund” (CLF) in February 2007 to assist Laguna Honda Hospital patients return to community-based settings, often through DPH’s Direct Access to Housing (DAH) program, there is now competition a decade later in 2017 for DAH program units from people coming through the City’s new Homeless Department. And reportedly, people being discharged from other private-sector hospitals were not able to access services funded by DPH and local funds. The CLF is now managed by the Institute on Aging with intake through DAAS’ central intake hub, which has a wait list. It’s not clear if IOA or DAAS accepts referrals to the CLF for patients discharged from private-sector hospitals, or whether the City’s new Dignity Fund will also support patients being discharged from private-sector hospitals. Second, Nadell asserts the key issue is not about “warehousing” people with disabilities in institutions, as has been long alleged. 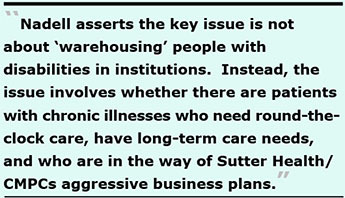 Instead, the issue involves whether there are patients with chronic illnesses who need round-the-clock care, have long-term care needs, and who are in the way of Sutter Health/CMPCs aggressive business plans to get out of providing SNF level of care. Third, Nadell notes that “post-acute care” is not “sub-acute care,” and CPMC has not tracked how many patients need round-the-clock care in order to help gauge demand for sub-acute care. Sub-acute care is Medi-Cal funded long-term care. He notes that “hospital cost controls are the de facto engine that has ruined institutional long-term care who need 24/7 nursing care for chronic disease management, which is not post-acute care, by shifting patients to community-based SNFs for short-term care. He asserts CPMC “tinkered” with its data to claim less of a need and demand for long-term care. And Nadell notes that conflating sub-acute level of care with post-acute care is to say people who need long-term care is secondary to reducing length-of-stays in hospitals to save the hospitals money. Finally, Nadell notes that other hospitals are discharging their sub-acute patients to community-based SNFs, without tracking morality, longevity, and re-admissions to other acute hospitals. Thanks to a coalition of community advocates working with the patients and family members at St. Luke’s SNF and sub-acute unit and family members of people at CPMCs Swindells Alzheimer’s facility, the Board of Supervisors appears to have realized that cramming the SNF care and sub-acute SNF care medical issues, and the non-medical RCFE issues, into a single hearing was inappropriate. So two hearings were scheduled. Supervisor Yee’s concerns were heard during a second Public Safety and Neighborhood Services Committee meeting on Thursday, December 7 at 2:30 p.m. That hearing focused on citywide Residential Care Facilities for the Elderly (RCFE) and related non-medical institutional care and housing issues. A third hearing at the Public Safety Committee needs to be held focused only on the lack of SNF-level of care in the City. Many organizations — including the private-sector non-profit hospitals and DPH and DAAS — having members on the PACC have been responsible for the shutdown of hospital-based SNFs, sub-acute SNFs, and acute psychiatric beds. 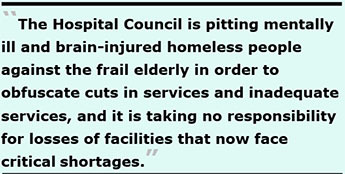 The Hospital Council is pitting mentally ill and brain-injured homeless people against the frail elderly in order to obfuscate cuts in services and inadequate services, and it is taking no responsibility for Hospital Council dues-paying members — both private-sector non-profit hospital “industry leaders” and public hospitals — for losses of facilities that now face critical shortages. CPMCs greed to maximize its patient revenues closely tracks the Hospital Council’s greed to extract membership dues from its member hospitals, all to the detriment of providing hospital-based services that San Franciscans deserve. I could be wrong, of course. But this all smacks of corporate greed, not healthcare or meeting actual community needs. It is appalling how long this has been going on, and the slow progress made to date. On May 19, 2015 the Health Commission adopted its resolution regarding the closure of St. Mary’s 32-bed SNF unit. The Resolution directed the Department of Public Health to research the needs for short-term SNF and post-acute care services. The first Post-Acute Care Project (Task Force) was launched in August 2015, and the Task Force issued in December 2015 its “Framing San Francisco’s Post-Acute Care Challenge” report, which the Health Commission got around to discussing in February 2016. Here we are in December 2017. The PACC has not yet released its final report, and appears to be begging for another gig that will take even more time. It’s not known when the Health Commission will schedule a hearing on the PACCs final report, but it is not likely to do so until January, or perhaps February 2018, damned near close to a three-year delay since its May 2015 Resolution on St. Mary’s. For its part, the Board of Supervisors first hearing on the proposed closure of St. Luke’s SNF and sub-acute units was held four months ago on July 26, 2017, with a September 12 “Committee of the Whole” follow-up hearing. Following an almost three-year delay, it’s as if there is no sense of urgency in City government. How much longer is all of this going to take before meaningful action to mitigate this crisis of an inadequate number of SNF beds and long-term care beds is taken? When will the City act to stop the out-of-county patient dumping, and eviction and exile? 1 CPMCs actual name is “Sutter West Bay Hospitals,” but it is doing-business-as (d.b.a.) “CPMC.” CPMC is registered with the IRS as a 501(c)(3) non-profit entity. 2 Dr. Warren Browner, CPMCs CEO, received total compensation of $1.25 million in the calendar year ending 2016, including his base pay, bonus-and-incentive pay, other reportable income, retirement contributions, and other non-taxed benefits. 3 Director of Public Health Barbara Garcia clearly had not paid attention to what caused the one-third reduction in scope of the LHH rebuild project from 1,200 beds to just 780 beds. Garcia misinformed the Board of Supervisors on September 12, 2017 about what really caused the reduction in scope. In May 2010, I published “LHH Lessons Unlearned Impacts All Bond-Financed Projects,” in which I reported that the LHH rebuild’s initial budget of $401 million ($299 million in bond funding and over $100 million from the Tobacco Settlement Revenue fund) had skyrocketed by a $183.4 million cost overrun to a total project budget of $584.4 million. Subsequently the project’s budget grew to $611 million, but it’s not clear whether that was for just 780 beds, or all the initially-planned 1,200 beds. The $183.4 million in cost overruns were largely driven by the known $71.6 million in “change orders” in 2010 that by November 2013 had climbed to $95 million in change orders. The City Attorney sued the architects, Anshen + Allen (later acquired by Stantec) for $70 million in design errors and design omissions, and construction errors. On November 19, 2013 the Board of Supervisors considered an initial proposed settlement with Stantec to recover just $19 million (27%) of the alleged $70 million in errors. By May 2014, the proposed settlement agreement shrank to just $15 million, representing just 21% of the $70 million in deficiencies the City had initially alleged. Settling for just 21% of the design and construction errors was a slap in the face to San Francisco taxpayers, who were in effect being asked to shoulder somewhere between $55 million in errors on this replacement project in the lawsuit and up to $80 million of the $95 million in change orders. Garcia clearly failed to mention that that scandal is what caused LHH to shrink, with a massive reduction in the scope of the rebuild, not that the LHH bond measure had been an insuffiicent amount, as Director Garcia misinformmed the Board of Supervisors. This is the same Commissioner Pating who suggested during the Health Commission’s February 2016 hearing on the “Framing the Post-Acute Care Challenge” report that perhaps the city should consider more “out-of-county, and maybe even multi-county” discharges as a way to meet the post-acute crisis. The San Francisco Health Network is supposed to be DPH’s part of the safety-net of City health care facilities. Sounds to me like “generating revenue” for LHH by admitting non-Health Network patients is Pating’s latest dim-wicket idea. There you have it: Even LHH, our public hospital, shot down the idea of expanding its care for dementia patients. We’ll have to see if Pickens’ claim that LHH operates at full capacity will stick in the face of political pressure, or if this is Pickens’ (and by extension, Barbara Garcia’s) gambit to somehow create additional space at LHH. It’s doubtful more space will be found on the LHH campus by building out more beds. And since LHH changed its mission statement in January 2016 saying it would provide “post-acute care,” (rather than long-term SNF care), we’ll have to see if the additional revenue from out-of-network dementia patients will somehow find LHH the additional space by curtailing even more of LHH’s short-term care or long-term care SNF beds — that according to Pickens, are already operating at full capacity. Sounds like there’s no room at the LHH inn.